Featured / Recipes / 09.06.2018. Home-made fresh cottage cheese and freshly milled flour are traditional ingredients of the continental or the green Croatia, reminding me of my childhood. And in late June when the treetops of my grandmother’s garden cherry would swing its red fruits, it was time for quite an unusual strudel. 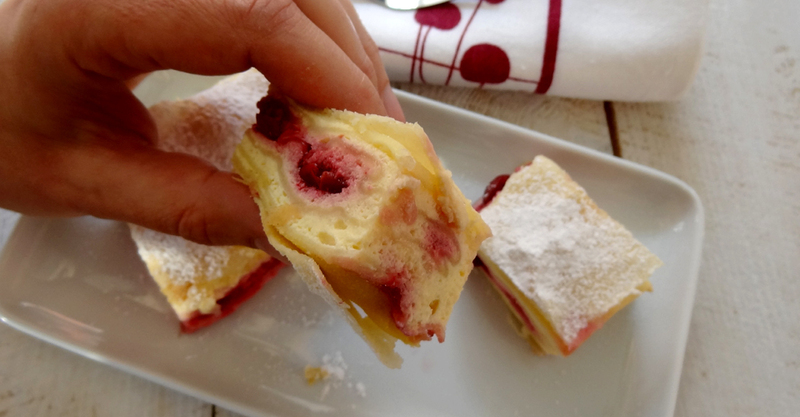 Filling made of creamy cheese and sour cherries found itself in a perfect harmony rolled up in a fine, thin filo pastry. Yummy! Sieve the flour, add salt, oil and water. Use an electric mixer to mix the ingredients for 15 minutes until you get mid-hard pastry. Form it into a loaf, coat with oil on both sides, cover with plastic foil and let stand for about 30 minutes. For the filling, separate the yolks from the egg-whites. Mix the yolks, sugar and vanilla sugar. Separately mix cheese with grated lemon rind until frothy, and then add yolk mixture. Mix it all well and then slowly stir in the whisked egg-whites. Flour the table, place the pastry in the middle and thin it with a roller. As necessary, during rolling additionally sprinkle the tablecloth. Coat with 3 spoons of oil and let stand for 10 minutes. Melt the butter on slow fire or in a microwave. Continue to thin the pastry with your hands (slightly pulling the pastry towards the edge of the table with your upper hands). Remove the edges. Pour the pastry with several spoons of butter. Distribute the cheese evenly till ¾ of the pastry. Distribute the cherries a couple of centimeters from the edge of the pastry in one row and sprinkle with bread crumbs. Fold the edge of the pastry over the filling, and then using the table cloths slightly roll the pastry to get a strudel. Even out the thickness of the strudel, remove the thick ends and move it to a greased baking pan by adjusting its length to the size of the pan by folding it or cutting it. Use the remaining butter to coat the strudels and bake them for 50 minutes in an oven previously heated to 180 °C (365 °F). Let the strudels cool a bit and then sprinkle with sugar powder.